Parenthood can be a struggle, particularly for families with multiple children in need of care, nurturing, protection and attention. But a weary mom or dad may find solace in the reassurance that all parents with several offspring face a similar challenge — even the non-human variety. 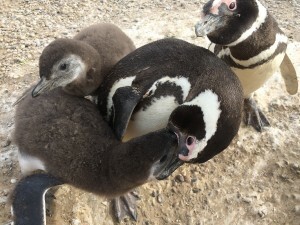 This finding surprised the team, since parents across the animal kingdom, including other penguin species, often allocate resources unequally to their chicks based on factors like offspring age, body condition, health and behavior, said senior author P. Dee Boersma. 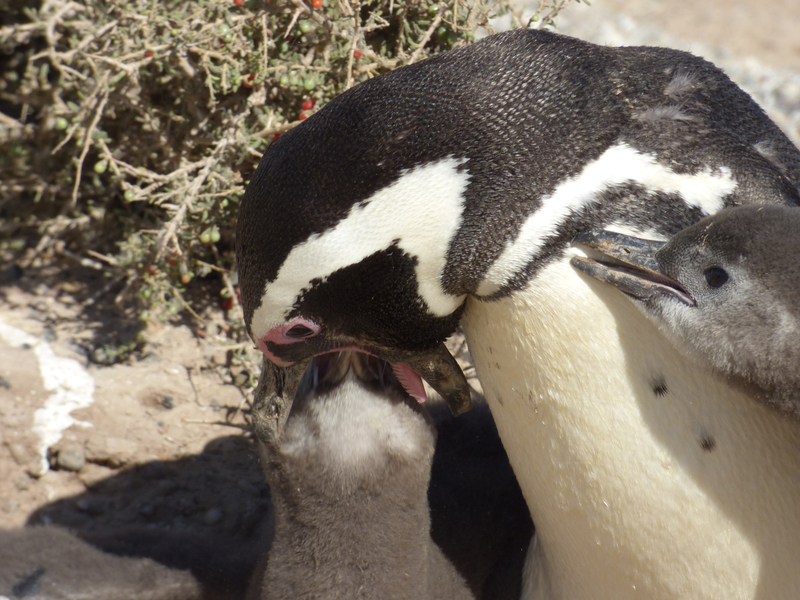 Boersma, a UW professor of biology and director of the Center for Ecosystem Sentinels, has for more than three decades studied penguins at Punta Tombo, a coastal region in Argentina that hosts one of this species’ largest breeding colonies. Magellanic chicks are the same size when they hatch, but eggs within a nest hatch at different times. After mating, a Magellanic female lays two eggs about four days apart. One chick typically hatches at least two days before the other. Chicks grow to different sizes based on the timing of their first feedings. By the time both chicks are at least 20 days old, one chick is on average 22 percent heavier than its sibling, the team found. Yet despite these size differences, this study shows that when Magellanic chicks are older and more mobile, parents feed both chicks equally as well as rapidly. “These findings raise some very interesting evolutionary questions about how and why this behavior — feeding chicks equally — arose,” said Boersma. 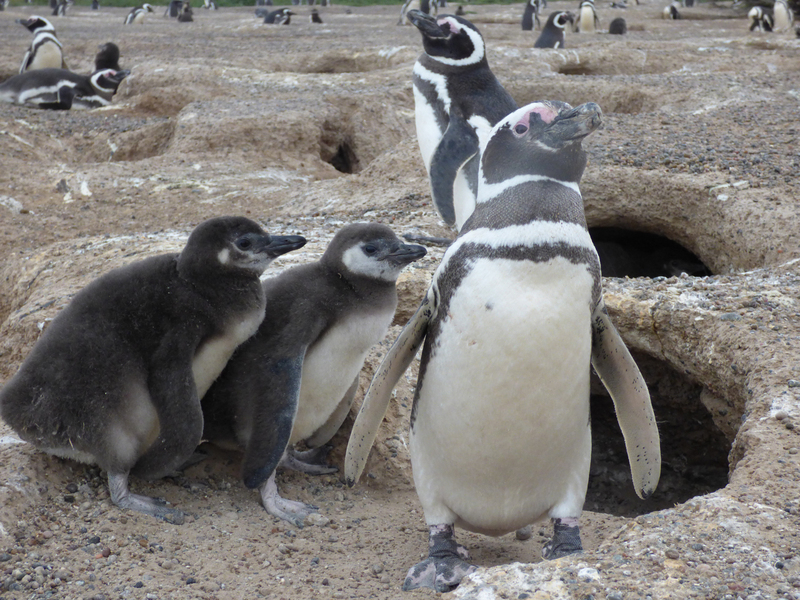 For this study, Boersma and her team observed parents feeding their chicks at Punta Tombo from 2003 to 2007. Past research showed that parents alternate roles when chicks are small: One stays at the nest to guard chicks while the other feeds offshore and brings back a belly full of fish to regurgitate into the chicks’ mouths. 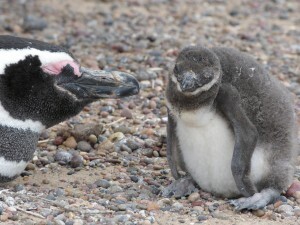 For this study, the researchers observed nests where the chicks were at least 20 days old to track whether chick behaviors, such as begging or competition during feeding, influenced the amount of food they received. The team weighed 218 chicks both before and after the feeding, and observed parent and offspring behavior during mealtime. Forty chicks came from one-chick nests — presumably cases where the second egg failed to hatch or the chick died of starvation — while the other 178 came from 89 two-chick nests. As expected, chicks without a sibling received more food during a feeding and were heavier than chicks with a sibling. Before eating, singleton chicks weighed an average of about 5.7 pounds and received about 1.2 pounds of food on average per feeding. For two-chick nests, the heavier and lighter chicks weighed an average of 5.1 pounds and 4.2 pounds, respectively. Yet both chicks received about 0.8 pounds of food on average per feeding. Parents with two chicks managed this equal division despite the rushed choreography of mealtimes. The researchers found that feedings lasted just 21 minutes on average, during which the parent used its flippers to keep one chick to its left and one to its right — turning its head to feed one and then the other. Light and heavy chicks begged a similar number of times and each switched sides five or six times during the feeding, yet siblings did not act aggressively toward one other. The researchers observed that the parent directed more non-feeding behaviors to the lighter chick, such as opening its mouth but not regurgitating any food. Yet ultimately the lighter chick received the same amount of food as its sibling. These findings shed light on when, where and how animals decide whether to treat their offspring equally or give preferential attention to one. For Magellanic penguins, factors affecting this behavior may be food supply, digestion and the time between feedings. In other penguin species, food supply impacts feeding behaviors. Adélie penguins, for example, have a relatively stable and abundant food supply because long daylight hours in Antarctic summers allow them to feed around the clock. 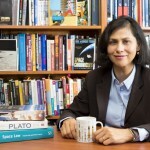 Boersma and her colleague Lloyd Davis at the University of Otago in New Zealand found that Adélie parents run from their chicks, and the chick that follows its parent the longest is typically fed the most. For Magellanic penguins, food is less plentiful, and chicks typically wait three to five days between feedings. Each year, about 40 percent of chicks die at Punta Tombo due to starvation, and research by Boersma’s group indicates that a chick is most at risk of starvation when it is between 5 and 9 days old. 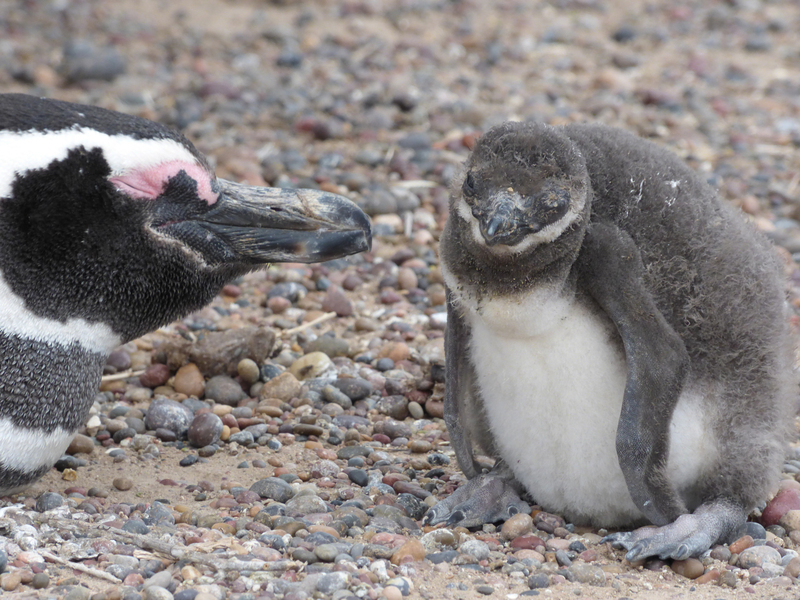 Magellanic parents are prompted feed chicks as soon as they arrive at the nest because food that digests too long in their stomachs is less nutritious for chicks. These factors may pressure adults to feed chicks quickly and equally, Boersma said. In addition, chicks may avoid direct competition because that could delay the feeding, she added. The age of the chicks in this study — all at least 20 days old — may also help explain their findings. “This behavior may have evolved because, once both chicks reach this age, it may be advantageous for the parents to try to raise both of their chicks to fledging — the stage at which chicks leave the nest — rather than preferentially giving one more resources than the other,” said Boersma. 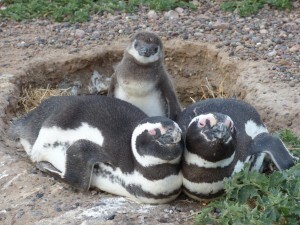 If so, then equality on the part of Magellanic penguin parents is less of an egalitarian virtue and more an investment in survival of the next generation. Lead and corresponding author on the paper is Eric Wagner, who worked on this project as part of his UW doctoral degree in biology. The study was funded by the Chase Foundation; the Cunningham Foundation; the CGMK Foundation; the Offield Family Foundation; the Peach Foundation; the Thorne Foundation; the UW Wadsworth Endowed Chair in Conservation Science; and Friends of the Penguins. 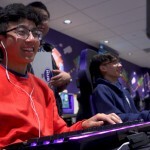 For more information, contact Boersma at boersma@uw.edu or Wagner at erlwagne@gmail.com. Boersma’s availability is limited currently due to field research.